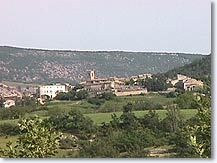 From Forcalquier, take the N100 then the D 5 linking Banon and Saint-Michel l'Observatoire. 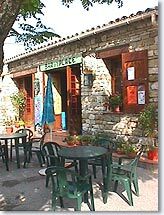 Revest des Brousses is a charming village situated on a small hill planted with heather, white oaks and black pines above the Largue river valley (which flows from the Lure mountain until La Durance, just before Manosque). While visiting the village, you will discover superb look-out points over the neighbouring hillsides, with the magnificent countryside of the Lure mountain in the background. 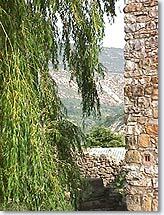 You will come across the church with its square bell-tower and after the ramparts you can see the Portail des Mourres (classified as an Historic Monument), a machicolation-style gate-way from the 15th century. Above the village, you can admire the outside of the "château de Pontevès". This superb bastide from the 18th century has today been well restored and is privately owned. Another beautiful residence known as the "château de Sylvabelle", is situated outside the village on the D18 in the direction of Ongles. The chateau (also privately owned) dates from the 17th century and possesses three towers and a round dovecote, a short distance away. Continuing on the same road (the D18 in the direction of Ongles) you will see on your right a wonderful view of the Bourbons hamlet nestled between two small hills. "Portail des Mourres", 15th century machicolation gate-way. 18th century "Château de Ponteves" (private property). 17th century "ChÂteau de Sylvabelle" (private property). 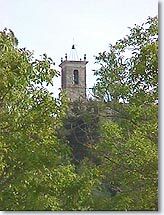 Saint Michel l'Observatoire (8km), Banon (10km), Simiane la Rotonde (15km), Forcalquier (19km).